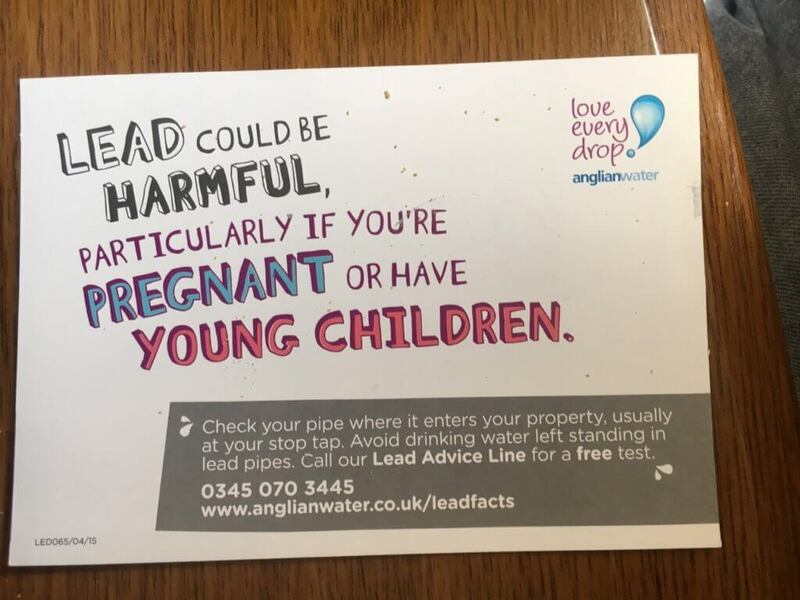 Anglian Water think that it is worth putting cards like this through their customers’ letterboxes (even though the pipes are the customers’ responsibility not the water company). Good for them! Whereas almost no supermarkets label the lead-laden game meat that they sell specifically for human consumption, and those that do get the wording badly wrong (don’t you Waitrose?)! Lead is a toxic heavy metal and can cause neurological damage, especially among children, at any detectable level. Mostly American studies but still relevant. Good for Anglian Waterc at least they are making a bit of an effort. The attitude of the super markets and Defra is yet another national disgrace of which this this Government is respect sable for most. My father lived in Wellingborough but died this January and when searching for the stopcock to turn the water off I discovered that the incoming pipes were the old lead ones. Obviously it was drinking the water that killed him but it took 91 years to finish him off. I was always told that in hard water areas that the calcium carbonate layer that gets deposited on the pipes prevents any lead compounds from getting in to the water.